How to Get Rid of Cradle Cap (Seborrhoeic Dermatitis)? You remember the ride to your birthing center. You remember the labor. You remember the baby’s birth and beauty. You get your infant home. In just a few weeks you become aware of a problem. There is something wrong with my baby. I was really concerned about dead skin or scabbing on our baby’s scalp, and I asked myself whether I was damaging my little one in something I was doing. We’ve all been surprised by our babies, and many of us have been surprised by what is called “cradle cap,” aka “infantile seborrheic dermatitis” or “pityriasis capitis.” Perhaps my experience may comfort you when you experience uncomfortable feelings when you first see a little scaly head in your bathinette. Here's what I found out. It looks something like dandruff, but cradle cap has a yellow-brown color with a scaly or crusty component. It may be thick or patchy. It has a greasy presentation, not dry like dandruff. Pediatricians typically see it on the scalp, but it has been found around the eyes (eyebrows, eyelids, etc. ), in the cheeks and center of the face, in the armpits, on the chest, in the groin area, etc. Our little one just had cradle cap on the scalp. Our doc assured us that our baby’s cradle cap was nobody’s fault and it was harmless. Although it is most commonly present in the first few months of life, adults in their 30s to 60s can have the problem. For our little ones, about one in ten will have the condition, boys or girls. The symptoms decrease rapidly before a child reaches 12 months and will typically be gone completely by age 4 years. 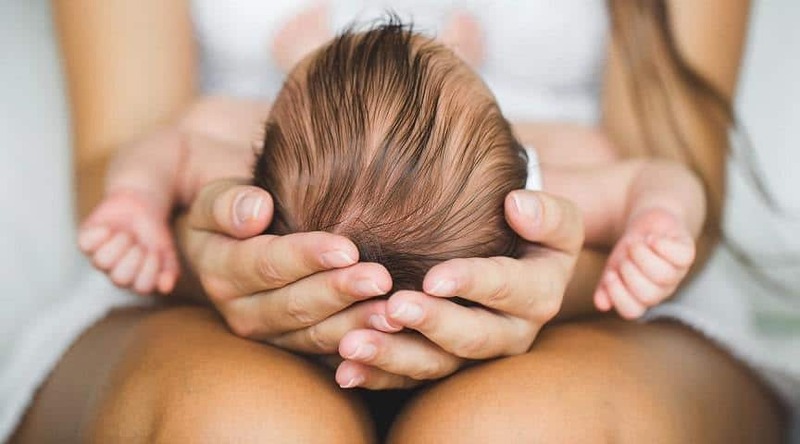 As for differentiation of the kind of cradle cap, most babies will have a minimal or mild case of non-inflamed cradle cap (i.e., seborrheic dermatitis) with less than half having an infection-related dandruff (i.e., pityriasis capitis). No clear cause has been identified for this mild infant malady, but we do know that fungal infections, hormonal imbalance, deficits in nutrition, immune system anomalies, etc. may contribute to cradle cap. Reduced production of gamma-linolenic acid (aka “GLA”) has been suggested as an etiology since the infant has an immature enzyme system for generating GLA. Allergies do not appear causative. It is not caused by your motherly- or fatherly-applied bathing skills. (With our parent guilt, it is so easy to blame ourselves. Don’t do that.) You and your baby do not “catch it” like a disease. Theories and old wives’ tales abound, but a “believable theory” suggests that in the weeks before the baby is delivered, the mom’s metabolism boosts the hormones that encourage the baby’s oil-producing glands. That’s enough for the problem to show up on your baby, but a yeast inflammation in the baby’s first weeks in response to glandular sebum generation may be a cause as well. The bottom line is that symptoms presenting in the weeks after birth may be caused by mom’s normal metabolism weeks before the actual baby’s birth. Remember that cradle cap can be crusty. Try applying some soft finger pressure motion to the cradle cap. You can even use a soft brush. Your goal is to dislodge the scales from the scalp, but don’t be so vigorous that you scratch the cradle cap. That is, “loosen” and don’t overdo your massage. What doesn’t come loose on the first day will eventually loosen up for removal. Baby soap or shampoos can be used once a day. There are soap-type products designed for managing cradle cap. Lathering up your baby’s scalp is obviously not your goal. Use enough water to get all the lather off the baby’s scalp and follow up with a little message or soft brush. Be sure your towel is not abrasive in texture and can absorb all the water. “Momma’s milk is best,” they say, but did you know it has special properties for healing that cradle cap? Collect some of your breast milk and message it gently into the cradle cap at bedtime. In the morning comb or brush the softened flakes, shampoo with warm water, and repeat the next application at the next bedtime. This kitchen chemical is antibacterial, is an exfoliant, and is a moisturizer of sorts. 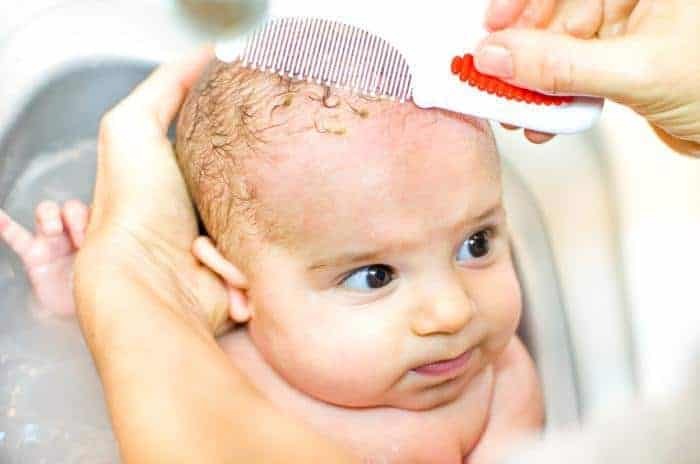 Take a mixture of half water and half baking soda, apply to the cradle cap, let it sit for a couple minutes, and then comb or brush off the cradle cap. Follow up with that baby shampoo. If your baby’s scalp is just too dry after you try this, mix the baking soda with almond, coconut, or olive oil instead of water and apply, followed by scalp time, and then shampoo. Baking soda may be similarly applied with apple cider vinegar being substituted for water or oil. “Natural oils” vary in their components. They differ on the vitamins within the oil, on odor, and on penetration absorption ability. There are many advocates for these various oils, but consider just a couple that have been used successfully for cradle cap, almond oil and olive oil. Remember that your goal is to loosen those dry scabby flakes. Here comes that rubbing again. Apply a few drops of oil to the baby’s scalp and allow it to remain there for maybe 15 minutes. Then take a brush or comb and gently remove those flakes. You don’t want to leave the oil on the baby’s scalp, so do your daily shampoo at this point. To negate sticky flakes or clogged pores, you can allow the shampoo to remain on the scalp for a few minutes before you lather up and rinse. Derived from the herb starflower and rich in GLA, borage oil has curative effects, enhancing skin moisture levels and smoothness, and bringing relief to dry and damaged skin. The idea behind using borage oil is to supplement the infant’s enzyme system until the child’s GLA production becomes normal. Applying the oil twice a day reportedly eliminates cradle cap in about half a month. Unfortunately it may recur. Regular use for up to seven months (to allow the enzyme system to fully develop) reportedly eliminates cradle cap altogether. With antioxidant and antimicrobial components, apple cider vinegar can help resolve cradle cap occurring with fungal infection components. It is strong, and it must be diluted with water, one part apple cider vinegar and four parts water. As with natural oils, take a few drops of the mixture and message into the cradle cap. Take care to keep this mild acidic from your baby’s eyes. Wash with that baby shampoo after the vinegar has been on the scalp for ten minutes. Baby skin is sensitive, so you may need to reduce the time of exposure to the vinegar, add more water to the mixture, or discontinue if your child has skin irritation present. You have this moisturizer around the house and already know it loosens crusty, scaley skin. Message some petroleum jelly onto the cradle cap, leave it on for an hour, then wet the child’s head with warm water. Apply gentle brushing or combing for a couple minutes followed by shampoo to fully remove the petroleum jelly. Use that soft towel to pat dry and repeat the process a couple times a week. 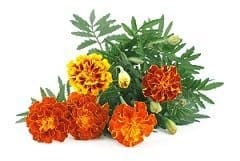 Petals of marigold have anti-inflammatory, antiseptic, and antiviral components that relieve inflammation and irritation and encourage healing by increasing circulation and improving the body’s production of collagen. Using marigold takes a couple weeks of preparation. Collect your petals in a jar and cover with just enough olive oil to reach over the petals. Let the petals and oil sit for a couple weeks, strain, and use the results on the cradle cap, a few drops of oil at a time--more waiting now, but just for 40 minutes. Use a brush or comb to gently remove those dead skin flakes and follow up with that shampoo. You can use this concoction until your baby’s cradle cap is gone. We live in a time when we have access to “well baby clinics” on a scheduled basis when we can deal with “normal” problems. When is cradle cap not normal? If you are uncomfortable with your baby’s progress with your attempts to manage this cradle cap or if the patches are bleeding or spreading beyond where they first started, say onto the infant’s face or body, try the “help line” for your baby clinic or pediatrician’s office for advice. You will be scheduled to come in for an evaluation. Your medical provider may recommend simple economical treatments available “over the counter,” a dandruff shampoo, a cortisone cream, etc. If a fungus infection is identified on examination, an antifungal topical will be suggested. Your provider may prescribe a medical intervention cream or ointment. Cradle cap is not uncommon, reportedly occurring in one of ten infants. Some feel it may be as common as in almost half of all newborns. Incidence is not the issue. We want our babies to be healthy and we want a body that is free, medical term here, of "lesions." We can do something about cradle cap. 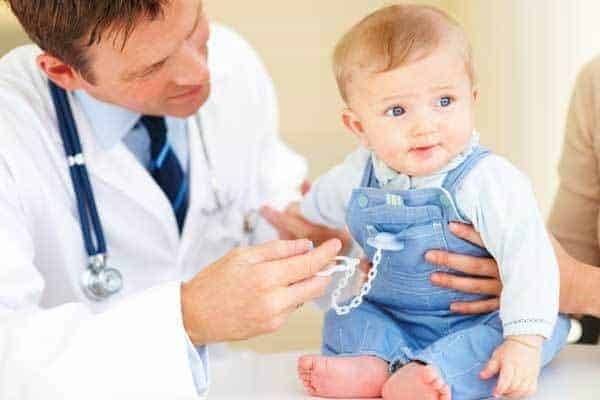 Yes, we can follow well-baby clinic advice and we can bring our children in for regularly scheduled appointments. But there are home remedies for this common condition when it is not a medical problem. Many of these remedies can be used with commonly available household supplies. We’ve laid out some more common ones here, but there are more. The references and links below may help you with further ideas. Have we helped you with your questions on cradle cap? Will you tell us what has worked for you?